You’d think that someone who does nothing, such as myself, would have more time to write a silly little blog. And you’d probably be right. But doing nothing is often very hard work. There’s a lot of thinking and planning that goes into it. Do I continue making kissing sounds at Dave the Cat for another hour or should I philosophize about why Velveeta is not per se a cheese in the classical sense. (Yes, I have thought about that. What, exactly, constitutes cheese? But that’s another blog.) In fact, I go so far as to say that doing nothing is often back-breaking and time-consuming—my nothing is so intense that it requires two compound adjectives. Take today, for instance. Today I thought about cereal for a while. Let me begin by saying that I adore cereal. In Spanish there’s fourteen-ish words for love and I’d use them all to explain my affinity for cereal if I hablaed Espanol. For now, “love” will have to do. I started the day off with some Kashi Strawberry Fields, which has a hint of sweetness and some nice red (dried) berries and flakes don’t get too soggy in milk. Delicious. There’s the Beatles reference, too, which doesn’t influence the taste necessarily, but does put me bouncy mood. Second course consisted of some banana nut Cheerios. This may sound gross. Personally I remember the fake-banana -flavored stuff that Dr. Gary Vance, DDS would use to numb my mouth just before sticking a needle in my gum. This was always followed by the drilling of and/or yanking at teeth. But banana nut Cheerios do not taste like fake banana. If they did, I wouldn’t eat them. They taste like heaven… heaven wrapped in glorious sunsets and served atop a shimmering rainbow. I love you, Cereal. But then I couldn’t help but think about all the other things I love to eat for breakfast. Donuts, for instance, make me light-headed. Don’t get me started on omelets, especially when they involve bacon. I made an Italian omelet once with mozzarella cheese and homemade marinara sauce that made me weep. Biscuits and gravy make me want to Sweat to the Oldies with Richard Simmons. (I’m not sure what this means, but I think it’s really, really good.) So it’s not just cereal. I like breakfast… a lot. Oh, Cereal. Don’t be jealous. By this time it was almost lunch. Lunch is the lovely intermezzo between the opening tympani of breakfast and the fat lady that is dinner. Lunch, for me, means sandwiches. Holy crap. Sandwiches. I like sandwiches with mayo and lots of black pepper. I like good bread. I like rich cheese and fresh veggies and mustard and… turkey. Dammit, I love turkey. And bacon. I like a Reuben sandwich and I don’t know if they named it after the guy from the bible, but it makes sense given that one of the name’s etymological roots is a Hebrew word meaning, he will love me. A Reuben sandwich will love you and love you good. (This information came from Wikipedia, which we all know can be suspect, but it works so I’m going to run with it. 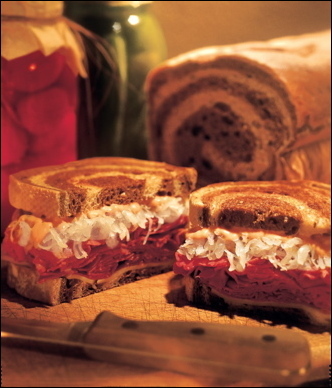 Regardless of its accuracy, trust me, a Reuben sandwich will love you.) I like crunchy chips with my sandwich and an orange soda. I used to make sandwiches out of nothing but hamburger buns and BBQ sauce. I called it a BBQ sauce sandwich. What’s not to like? I like sandwich’s cousin, the wrap. The wrap is a one-handed sandwich. I once made a wrap out of yellow mustard and Gold Fish (the cracker). Okay, so I like lunch too. Who doesn’t? Cereal, it’s not a denial of what we have together. No, no, Cereal, it’s not that you’re not intelligent… We just have a different relationship… No, don’t leave… Of course you complete me… How many times have I told you that we’re soul mates… Yes, but I’ve said it different ways… Do I have to actually use the term “soul mate…” But that was just one time… I don’t have a problem… You’re just being emotional… Come sit down. Oh, Cereal. Sure I love dinner, too. What do I love so much about it? I love… Sorry, I enjoy casseroles. Come out with me some time and we’ll get a nice chicken mole enchilada. Gnocchi with a Caprese salad to start. No, you don’t pronounce the “g.” Oh, Cereal, now you’re just getting nitpicky… It’s not hoity-toity, it’s part of the language… Yes, I love simplicity… You’re simple, Cereal. Maybe once in a while I’ll eat an entire large pizza with Canadian bacon and pineapple and jalapeños. 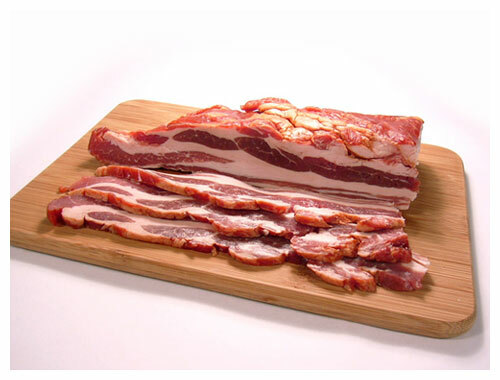 Sure you can have bacon for dinner… It’s not gluttonous… You can have bacon for any meal… Oh, the Canadians have just as much right as anyone else. Well, now that you mention it I also like a buffalo burger… Yes, bison, tatonka. I’m being unreasonable? Fine, how about this: I love butternut squash ravioli with fried basil leaves. That snooty enough for you? I love lightly seared Ahi tuna. I love raw tuna for that matter. You won’t even try sushi. Sure I like Velveeta… And bacon. Why’d you have to go there, Cereal? I don’t have a problem… Well, yeah… But doesn’t everyone love to eat?… Of course you’re enough for me… Most of the time… Twelve step program? Isn’t everyone a little skinnier in high school? It’s not a coping mechanism… What do I have to cope with? I’m needy? You’ve thought this all along? I’m just craving attention? The blog has nothing to do with it… Sure I eat to make myself feel better. What’s wrong with doing nothing? I guess I’m bored… It might make me feel a little better… Yes, that sounds nice. Let’s go with the Honey Nut Cheerios. Not too much milk… And a big spoon… Have the Lucky Charms on standby.